A safety nets, gives much-more time to a falling object to come into zero velocity than hard ground. In physical terms, this means more time for deceleration and kinetic energy transfer, resulting in a softer landing and much lower risk of damage. What-kind of safety nets to-be used, depends upon many factors, (such-as the factors that could determine force of the impact) such as falling-objects’s speed and mass. To encounter more-force, a more total-width of the net, is required. The minimum-distance of the spot on net at which object impacted, and the edge of net (nearest-edge), matters, and to be kept more than certain-limit. There is role of materials used to make the ropes of net (such-as an iron-rod-grid will-not work as-good-as flexible and extensible ropes), and the tension or stretch used to make the net (stored in the ropes), also have some roles. The net is to be set at an appropriate height from the hard-ground, so-that the object, along-with the rope, does not clash with the hard-ground. The mesh-hole size should-not be so-big that falling object/people/part-of-it could pass through the holes. Minimum energy absorption of the 3 x 3 m test net (see table)During work involving the risk of falling, the installation of fall protection is legally mandatory. The German Occupational safety nets and Healthy Act (ArbSchG) constitutes the legal framework for health and safety at work. This act is, in turn, shaped by accident prevention regulations. The use of safety nets is specified DGUV safety net information sheet no. 101-011. 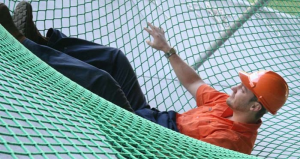 The product standard for safety nets is the European Standard EN 1263-1.Only safety nets that conform to this standard are approved products as stipulated by DGUV rule 101-011, and thus also approved fall protection equipment as stipulated by the German Occupational Safety and Healthy Act (ArbSchG) and the accident prevention regulations.